The second match of New Zealand Vs. Pakistan Test Series 2018 is taking place in U.A.E but fans of Pakistani cricket are talking about something else rather than cricket. 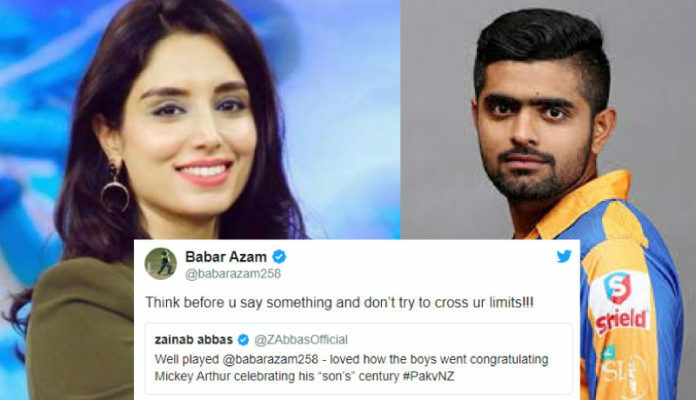 It is the Babar Azam’s brutal reaction over sports anchor Zainab Abbas’s congratulatory tweet which is making people scratching their heads. It all began with Babar Azam’s good performance in the test match. The batsman made his first test century and received huge applause from fans and fellow cricketers. Zainab Abbas a sports anchor and a cricket commentator who gained popularity after covering Pakistan Super League matches and then Champions Trophy 2017 also congratualated Babar Azam. In her tweet she said, “loved the boys went congratulating Mickey Arthur celebrating his “son’s” century. 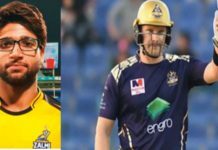 But, it seems that cricketer didn’t like something about the tweet or it was probably the word “son” that offended the batsman so he asked Zainab to think before she says something and not to cross her limits. 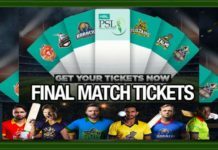 Why Babar Azam Said So? Babar Azam who was also listed in the ICC’s team of the year in 2017 is one of the talented cricketers of the world. The young batsman is proving himself in the field every passing day. While fans are happy about his performance and his achieving of a milestone in test cricket they are also thinking why he responded in such a blunt manner to what seems a simple appreciation of his achievement. Zainab Abbas’s tweet just seems a simple appreciation of coach Mickey Arthur who is mentor and teacher of every single player. It is more likely for teachers to call their pupils and trainees as their kids. So, apparently there doesn’t seem anything wrong with what Zainab said. But, fans were coming up with their theories. Few were even raising a point that Babar Azam’s response was due to his lack of education and the fact that he couldn’t fathom the real meanings of what was just a congratulatory note. Not saying that Education/English speaking skills should be pre-requisite to play International but what Babar Azam, our most talented batsman, just did is the clear cut case of lack of education. Its better if players are made to stay away from social media or hire SM managers. Was It a Sign of Arrogance? This Twitter handle suggested that Babar Azam responding in this manner was because of his arrogance and his not being able to handle success. Few were also calling this reply as an off-field performance. This guy concluded that it was because of Babar Azam’s lower IQ. He used the cricketer’s example to generalize it for all Lahoris. Babar Azam typical lahoriya low IQ. Zainab Abbas is yet to react on what Babar Azam said in response to her tweet. But fans are still unable to get what was that after putting up such a brilliant performance.